E & O Officer: I have the best job on the ship!! One of the scientist’s on Expedition371, passed our office and commented to me “You really do, have the best job on board.” I sat and thought and decided…” Yes, she’s right. I really do have the best job on the ship. Every day I learn something new, everyday something exciting happens, and every day I appreciate the amazing journey I am on!! 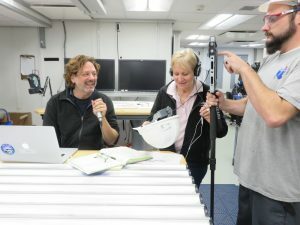 The videographer Adam Kurtz and myself, on our very first day at sea, our day began with a 7:00 am meeting in the chief scientist’s office. Expedition 371, has attracted a very big media following. We discussed the protocol for media link ups, and what interviews the scientists were going to be doing, while we were away at sea. In our first week, we helped to organise media interviews for the co-chief scientists. I never dreamt, that I would be chatting with the BBC one-day, organising Houston and Spanish radio links the next, and helping to run a podcast interview for the Canadian science show, Den of Lore, the following day. The project objectives of EXP 371, is to drill on the submerged continent of Zealandia and in doing so, rewrite the plate tectonic history of the Tasman Sea. The geological phenomena of the “submerged continent of Zealandia” had hit the headlines. The senior lab officer, Bill Mills stepped in, to talk about the equipment specifically designed for the ship. No one knows the equipment, better than Bill, and it was such an honour to have him talk to a very captive audience at the Geoscience (Australia) open day. Driller Glen Barrett, as we were in transit, came down from the driller’s ‘dog house’ to answer a question from the group. Our experienced group of geologists never hesitate to explain new concepts of biostratigraphy in the NZ paleogene, or the paleoclimate of an Oligocene foraminifera rock formation. The sediments have a story to tell of how life and climate have changed throughout geological time. I have the world experts here, who are happy to talk to me, about what they have found. I am somewhat technology challenged and during my moments of IT ‘melt down’, Adam Kurtz just stays calm cool and collected!!…. He saves my sanity, every day, one way or another!! 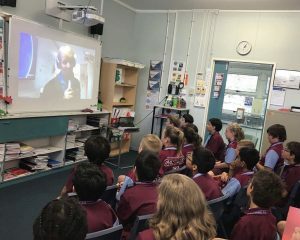 We now have a steady flow of ‘Ship to Shore’ link-ups, with various schools and community groups, from around the world. The Geological Society of Cornwall, Geoscience (Australia), Children’s newspaper, press4kids from New York, Colleges and schools in LA, Brooklyn Public library NY, schools in Germany, Switzerland, Chile, Brazil and Australia, the list goes on. My day started chatting to people from the media in Spain, and my day finishes doing a practice link with Brooklyn Public library in NYC. What an incredible journey for 2 months of my life! I would encourage any science teacher to apply for the Education and Outreach position on the Joides Resolution, every day is truly an amazing journey! What better experience could we have, than helping to educate our future scientists.